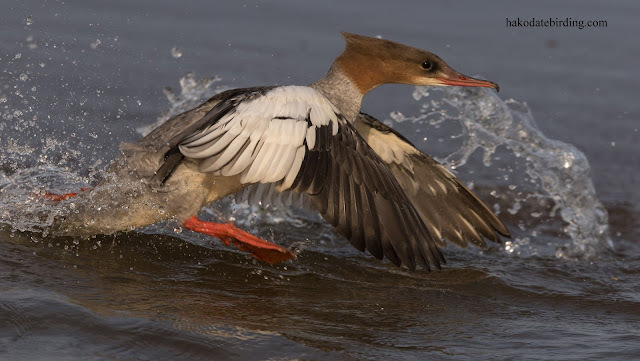 A family of scruffy moulting Goosander are on the river at Kamiiso every summer. They can't fly at the moment and if they need to move quickly they thrash and paddle away in a flurry of stubby wings and splashes........it seems to be effective in a desperate kind of way and they just about get the job done. Probably some metaphor in there somewhere. The heat/humidity seems to have receded slightly...........hopefully not just a temporary respite. Before long they will have their flight feathers again. It looks pretty much all there to me. Outer primaries maybe a bit short? Very attractive-looking duck, whether it can fly or not !